ECE department organized a two day National Level workshop on “Internet of Things-Hands on Training” on 14th and 15th March 2016. More than 100 participants (20 batches of each 5 students) from various institutions participated in the workshop. The convener of the workshop is Dr. S. Chandra Mohan Reddy, Assistant Professor & Head of ECED. Dr. D.Vishnu Vardhan, Assistant Professor of ECED is the coordinator of the workshop. ECE department organized a two day National Level Students’ Technical Symposium “Scintillace 2k16” during 14th – 15th March 2016. The convener of the symposium is Dr. S. Chandra Mohan Reddy, Assistant Professor & Head of ECED. Dr. D.Vishnu Vardhan, Assistant Professor of ECED is the coordinator of the symposium. ECE department, JNTUACEP organized a two day National workshop on “Linear IC Applications : A Systems Approach (with hands on training)” during 25th – 26th September 2015. The staff coordinator of the workshop is Dr. S. Chandra Mohan Reddy, Assistant Professor & Head of ECED. ECE department organized a two day National Level Students’ Technical Symposium “Scintillace 2k15” during 6th – 7th March 2015. The convener of the symposium is Dr. S. Chandra Mohan Reddy, Assistant Professor & Head of ECED and Smt. K.Aparna, Assistant Professor of ECED is the coordinator of the symposium. 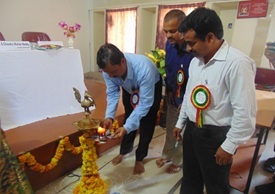 Lightening of the lamp by Chief Guest Prof. K.Govinda Rajulu,Principal,JNTUACEP and all the dignitaries holding the CD at inaugural on 6th march 2015. ECE department, JNTUACEP organized a two day International robotic championship “RoboTryst 2014-15” in association with IIT-Delhi during 22nd – 23rd August 2014. The staff coordinator of the workshop is Dr. S. Chandra Mohan Reddy, Assistant Professor & Head of ECED. Prof. M.L.S. 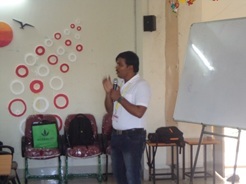 Deva Kumar was the Chief Guest of the workshop. Inaugural speech by Chief Guest Prof. M. L.S.Deva Kumar on 22nd August 2014. ECE department organized one day National Level workshop on “Arduino Microcontroller” on 9th May 2014. 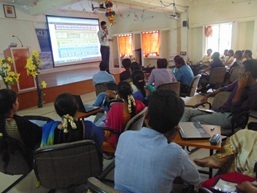 More than 100 participants from various institutions were attended to the workshop. The convener of the workshop is Dr. S. Chandra Mohan Reddy, Assistant Professor & Head of ECED and Sri. D.Vishnu Vardhan, Assistant Professor of ECED is the coordinator of the workshop. ECE department organized a two day National Level Students’ Technical Symposium “Scintillace 2k14” during 9th – 10th May 2014. The convener of the symposium is Dr. S. Chandra Mohan Reddy, Assistant Professor & Head of ECED and Sri. D.Vishnu Vardhan, Assistant Professor of ECED is the coordinator of the symposium. 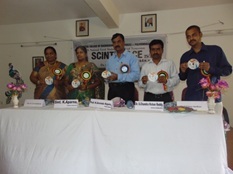 Lightening of the lamp by Chief Guest Prof. K.Hemachandra Reddy and Release of Souvenir by the dignitaries at the inaugural ceremony of Scintillace2k14 on 9th May 2014. 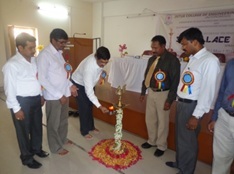 Prof. K. Hemachandra Reddy, Honorable Registrar of JNTUA lighting the lamp at the inaugural function of the workshop on 24th January 2014. 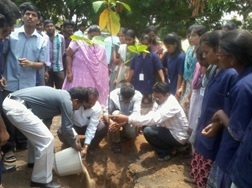 Sri. 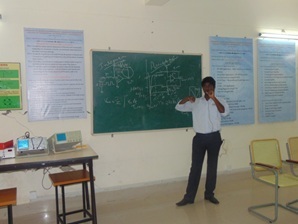 T.K.Senthil Kumar (One of the resource persons of the workshop DIP-PRM’14) delivering the lecturer during the workshop. 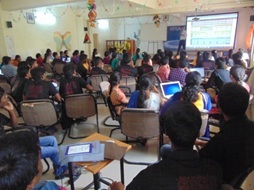 ECE department organized a two day workshop on “Robotics” on 21st and 22nd February 2013 in connection with National Robotic Championship-2013 (NRC 2013) jointly organized by IIT Khargpur and ARK technosolutions, Mumbai. The convener of the symposium is Dr. S. Chandra Mohan Reddy, Assistant Professor & Head of ECED and Ms. Sk.Taj Mahaboob, Assistant Professor of ECED is the coordinator of the workshop. ECE department, JNTUACE, Pulivendula is selected as one of the Zonal centre for conducting “National Robotic Championship-2013 (NRC 2013)” jointly organized by IIT Kharagpur and ARK Technosolutions, Mumbai. 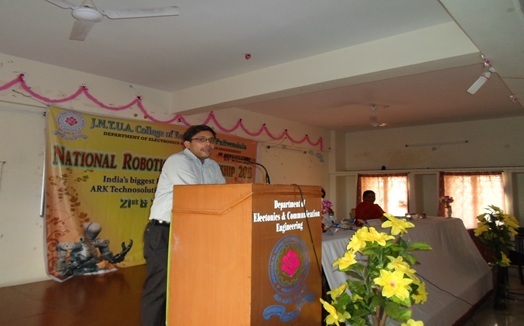 And also organized Two day workshop on “ROBOTICS” on 21st and 22nd February 2013 in connection with NRC 2013. The convener of the workshop is Mr. S.Chandra Mohan Reddy and Coordinator is Ms. Sk. Taj Mahaboob.